Arrive at one of Andalucía’s high-class hotspots in style, as you land on your private jet charter. Malaga is a popular destination for both celebrities and the super-rich alike, due to the unbeatable weather, seclusion and exclusive property that it offers. It has been witness to Prince’s spray painted purple mansion, European royalty and a Saudi Princess. Handsome British actor, Hugh Grant, has residency in La Zagaleta. Your first stop on your beautiful, sunshine filled, luxurious vacation has to be Museo Picasso Malaga. With over 285 donated works from Picasso’s family, the museum enraptures you and fulfils your curiosities. Pablo Picasso was known for co-founding the cubist movement and his artistic influence within the twentieth century. He spent a large portion of his life in France; however, the prominent artist was born in sun-drenched Malaga. Soak up the cultural heritage of Picasso, as you admire the many artworks on display. Once you have appreciated and delighted in all that this beautiful collection has to offer, head towards Malaga Cathedral, just a few minutes stroll from Museo Picasso. Visualise a triumphant renaissance tower complimented by its Baroque style façade, a stunning piece of architecture that should be visited by everyone in Malaga. A late dusk sees the Cathedral glowing with warmth; continue this dreamlike state as you enter through the large, intricate doors. Inside a great high ceiling, with the highest point being the 84-metre north tower, which unusually is not mirrored with a south tower, greets the recipient. In fact, the south tower remains unfinished and has led to the cathedral being referred to as La Manquita (one-armed!). If you require a tranquil atmosphere, perhaps remain quietly in this beautiful structure and let the heady musk awash your sensibilities. A Taste of the Traditional, With a Twist! If after a long day of exploration, adventure and relaxation, you want to kick back with a fine wine and some tapas to tantalise your taste buds, head to El Pimpi Bodega Bar. El Pimpi, a renowned winery, provides the clientele with an exclusive, yet traditional experience. A unique spot, El Pimpi has antique décor around a century old, complete with an array of rooms that appeal to people from all walks of life. If you are in the mood for a young, lively atmosphere with beautiful natural light, the Carmen Thyseen room delivers party and flamenco! Tertulias Hall of Barrels is where creativeness and intellect coalesce; enjoy the traditional Malaga style décor as you sip on a delectable beverage. Perhaps most of all you are looking for a view, you will discover this in the Palomar Picasso room, where the balconies overlook Alcazaba and the Roman theatre. Furthermore, the pedestrianized street Alcazabilla has a terrace that presents an authentic ambience. Unwind with a glass of the finest wine, and soak up the beauty of the gardens of Ibn Gabirol. El Pimpi also has rooms to offer. The hotel will excite, enthral and deliver a wonderful service to suit all clientele. A place that is frequented by celebrities, locals and tourists, El Pimpi combines wine, art and culture, and as of 2014, it now contains a gastronomic space with delicious cuisine. 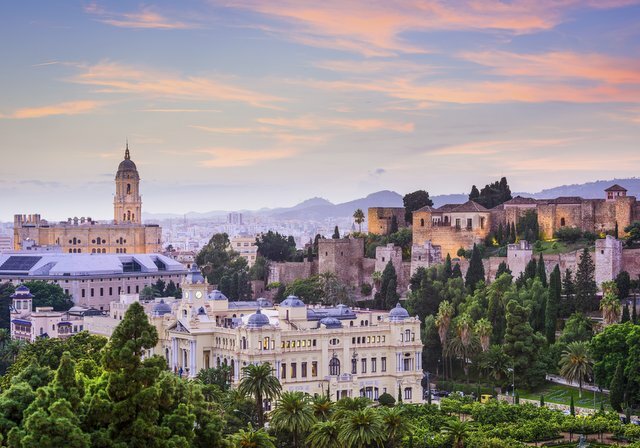 Malaga, as well as being the cosmopolitan capital of the Costa del Sol, has a myriad of undoubtedly stunning beaches, and can provide some quiet seclusion, a little more of a wild ambience or fun filled beaches for all the family. With a plethora of beaches situated along the Promenade of Pablo Ruiz Picasso, you can also experience the many bars and restaurants. If you are hankering after some clean sands and azure, open water, head to the family friendly beach of El Palo. With a reconstructed shoreline, it gives a larger and improved beach area to unwind, with the offer of diving and fishing, for those who find lounging under a parasol a little tiresome.